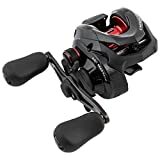 The Best Baitcasting Reel Under 100 Dollars - Best Baitcasters of 2019! If you are searching for the best baitcasting reel under 100 dollars, look no further. For this price or less, you can get a great baitcasting reel that’ll last for years of great performance. With the help of this guide, we will highlight some of our favorite options for the best baitcasting reel for the money. We’ve put together a list of reels in order to find the best baitcaster under 100 dollars. We hope this article will save you some time making your choice for a new reel. This helpful table may help you find all the details you need to choose your baitcasting reel. If not, keep reading for more information of the best baitcasting reel under 100 dollars. The Shimano Caenan is a beautiful reel that offers outstanding performance. It is clearly a very aesthetically pleasing baitcaster, but it also is a great value as a reel itself. With a retrieve ratio of 6.5:1, it is a fairly quick reeling reel, though not the quickest. This makes it ideal for lures that shouldn’t be reeled too quickly and actually make it an ideal option for the vast majority of fisherman. It has 6 ball bearings that will provide a pretty smooth reel as well as cast. The grips are made of EVA foam and are rounded for comfort. It is rated for 155 yards of 10 pound test line, and weighs only 7.2 ounces, making it a fairly light reel. Here is the fastest reel out of these three for those primarily doing spot casting, then quickly reeling back in to re-cast, or those consistently using fast moving lures. It would also be the best reel for those pulling in quick running fish so they can never get ahead of you to get slack. It’s so fast because it has a 7.5:1 gear ratio, one of the quickest available, which is blazing fast. This reel also has 9 ball bearings to make it incredibly smooth as well. The body of the reel is made from a single piece of aluminum, making it durable but also extremely lightweight at only 7 ounces. It is designed to hold 150 yards of 12 pound test line. Many reviewers say this was the smoothest, fastest baitcaster they have ever used, and the specs definitely uphold that opinion. This version is a right handed version, but you can find left handed versions there on Amazon as well. If you need speed in your reel, this reel is definitely the best option best baitcasting reel for the money. Lastly, we have the Pro Max from another renowned fishing manufacturer, Abu Garcia. This reel comes in in between the other two reels with a retrieve ratio of 7.1:1, which is also considered to be a fast reel. 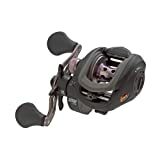 It has 7 ball bearings for a smooth reel and cast. The body is made from a single piece of graphite, and it weighs 7.3 ounces. This reel is also available in both right and left hand orientation. The standard PMAX3 is right hand, while the PMAX3-L is left handed. The Pro Max 3 is rated for 145 yards of 12 pound test line. This reel is a great starter reel at a great price, and many compare it favorably to the Revo, a much more expensive Abu Garcia baitcaster. This baitcasting reel is a strong option for the best baitcasting reel under 100. Overall, you can’t go wrong with the Abu Garcia Pro Max. Depending on what you want out of a baitcasting reel, any of the three above are a great option for the best baitcaster under 100 dollars. 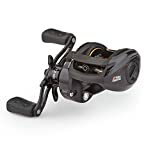 Choose the one that fits your needs well – the Shimano Caenan for reliability and power, the Lew’s Speed Spool for speed and lightness, and the Abu Garcia Pro Max for quality at a great price. Any of these would make a great candidate for the best baitcasting reel for the money. Good luck on the water!